Land Minister Shamsur Rahman Sherif has said there is no room for terrorists and militants in Bangladesh as the present government is determined to establish peace and tranquility through ensuring democracy and human rights in the country. "The present government has been working relentlessly to root out all networks of the militant outfits, as Prime Minister Sheikh Hasina declared a zero tolerance policy against terrorism, militancy and drug abuse" he said after laying foundation stone for constructing a Muktijodhha Complex at Atgharia upazila of the district. He urged all to extend their hands of cooperation towards implementing the zero tolerance policy against terrorism and militancy and said Prime Minister Sheikh Hasina's strong adherence to the rule of law would greatly help in rooting out militancy, terrorism and all other crimes from this country. Referring to Father of the Nation Bangabandhu Sheikh Mujibur Rahman's announcement to ensure food, cloth, housing, education and healthcare for all citizens of the country, Sherif said Prime Minister Sheikh Hasina is moving towards the path of her father. He said Bangladesh has long been on the highway of development under Prime Minister Sheikh Hasina's able leadership and Taka 100 crore is being spent for the development works in Atgharia upazila. "That day is not too far when Bangladesh will secure its place on the line-up of the developed countries of the world," he said. 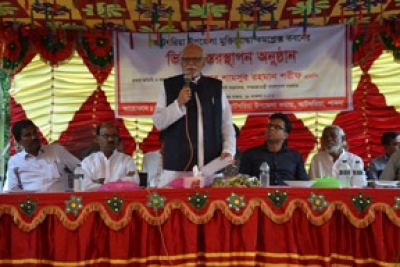 Chaired by assistant commissioner (Land) Golam Morshed, the rally was also addressed, among others, by Engineer Rabiul Awal, Poura Mayor and Upazila Awami League president Shahidul Islam Ratan, general secretary Abdul Gafur, freedom fighter commander Zahurul Haque, freedom fighter Quamrul Islam Futu, Pabna district deputy freedom fighter commander M Selim, freedom fighters Anwar Hossain and Sultan Mahmood.